It’s a classic of classic lines. Certainly it came from some rocker. Gotta be one of the Stones, right? Or a member of the Dead? At least a steely cool Rat Packer, then? Nope. It was ragtime pianist/composer Eubie Blake, reflecting back on the occasion of his 100th birthday. Fitness is on a lot of peoples’ minds, and as it turns out, long before their centenary. They’re even thinking about it while on vacation. Martinis by the pool might’ve fueled earlier Palm Springs getaways. From the practice tee to orchestrated exertion, the buzz of choice now is endorphins. Where’s Dino when you need him? Before asking for an employment application, consider that Fisher is a health enthusiast, having participated in crew in college, and her ex-Marine boyfriend is a triathlete, and for whatever rigorous demands she faces in the line of duty, her idea of getaway enjoyment is fitness boot camp, even if it comes with Egyptian cotton linens. Triathletes have to get back into fitness? I missed the memo. Fisher and her beau ended up at the Pinnacle Challenge, a three-day wellness retreat in Palm Springs. The curriculum is varied, a mix of yoga, stretching, massage therapy, hiking, strength conditioning, recovery, water exercise, organic eats, health and fitness assessments, and a bit of practicum so participants don’t leave it all behind on vacation. If the program sounds rather standard for the genus, the intensity of it might be more unique, and all ability levels are embraced. It’s not just about reps and aerobic deprivation and Indy-like heart rhythms. Now in its fifth year, the challenge emerged after founder Robin Sullivan attended yet another fitness retreat and realized that while she’d had a good dose of exertion, it really amounted to nothing more than a long workout. She also enjoyed hiking on high. The hills and mountains that ring the Coachella Valley are home to scores of trails, a good portion of which owe their existence to the historic comings and goings of the Native Americans who first settled the area. And most anyone can hike, on their own, under the auspices of a program like the Challenge or via the services of a guide. The valley’s an easy place to hike, in the sense that some of the best hikes have convenient jumping off points, as in starting from atop the Palm Springs Aerial Tramway after having 8,000 feet of sheer vertical rise and 11 miles of treacherous trail knocked out in a matter of minutes. In town, the Indian Canyons trace fissures in that same range of rock, tracking year-round streams, skirting waterfalls and weaving through some of the largest palm oases in existence. And just off to the north is the big kahuna of Southern California wild places, Joshua Tree National Park. These are what area guide Scott Scott of Trail Discovery calls the big three of desert hiking. The Indian Canyons are #1 in popularity. Proximity helps, being literally on the edge of town. And the oases are true natural gardens, and they help visitors gain an appreciation for how it is the Cahuilla Indians could survive here eons before central air and Costco. The San Jacinto mountaintops score as much for the wilderness of pine and meadows as the tram ride, itself. Joshua Tree is simply “intriguing,” Scott says, and all of his clients seem to have some preconceived image of the magical place, whether that’s a visual derived from a U2 album cover or one conjured up from tales of long-ago desperadoes and miners in an arid jumbleland of rocks and otherworldly plants. Admittedly “go explore, young man” isn’t quite finite enough in terms of a map to follow when heading out into something as large as a national park, so may I suggest Lost Palms Oasis near Joshua Tree’s southern entry, the nearest access point to the valley. Oases are to our desert as bowls of perfect snow are to skiers; there’s a lot of desert and there’re a lot of mountains, finding either powder or native palms is rare and memorable. A moderate seven-plus-mile out-and-back hike of solitude and big sky along hard-rock wash, bajada and ridge delivers hikers to palm-top level above one of the desert’s largest stands of Washingtonia filifera. Most daytrippers content themselves with the on-high view, but scramblers can explore the oasis and reach others in secluded nearby canyons. If scrambling sounds like a familiar concept in the desert, remember that the “athletic” activity of choice for decades has involved quick spasms of misdirected energy interrupted by long interludes of riding around in a motorized vehicle … golf. For practitioners of the grand obsession, scrambling is the noble art of creating slight discomfort out of great misery, and the occasional miracle. If your name is embroidered on your bag and companies pay you to play their equipment, you scramble far far less than the rest of us, and far far better when required to do so. The academy takes a holistic approach to golf instruction and improvement. Bucy and his gang are PGA-certified instructors, and offer individual lessons, clinics, and two- and three-day golf schools. Players can be fitted to Ping, Adams, Titleist and TaylorMade gear, with diagnostic equipment and a real-life green-grass driving range that’s lacking at indoor net-only fitting centers. 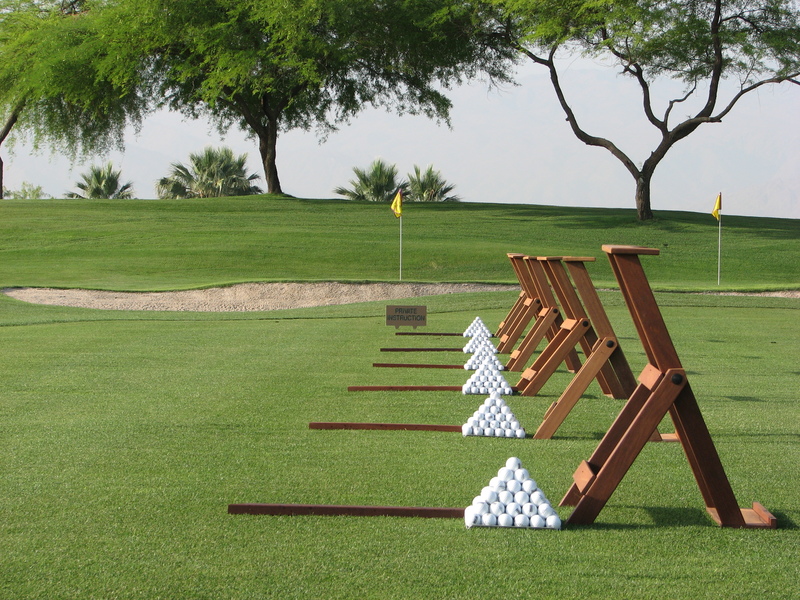 Titleist set up one of its Performance Institutes at Desert Willow, where swing analysis is performed in light of a physical attributes assessment—strength, balance, pelvic rotation and the like—and the result is a blueprint of instruction and exercise, keyed heavily to flexibility. The academy also has at its disposal 36 of the most comely golf holes owned by the local citizenry, and most of the locked-gate crowd, if we’re talking. Firecliff is a rock star, a flat-desert routing that any of the mountain-hugging desert courses of Scottsdale and Tucson would be pressed to beat. In a valley fraught with cookie-cutter condo-alley golf, Firecliff dispenses with most urban intrusions and shreds the usual playbill. What players get in return are par 4s where driver-putter, driver-5-iron and hybrid-sand wedge are all valid combos; three-shot holes where each shot matters; 9-iron and 3-iron threes; and a call for parachute irons and shots run in low. And with little doubt it is draped in the most dazzling flora to grace a course between Madame Pele’s preferred abode and a certain town in Georgia. Good photo ops don’t always equal good golf, that one scorecard-gracing hole that’s hooked all of our attention at times, only to learn that Snow White actually has 17 dwarfs. That most all the way around Firecliff looks like a stunning palm oasis isn’t window dressing. Mountain View is the kinder gentler sibling, the understudy with similar skill sets if not as much expertise and sly trickery. The course went to boot camp, itself, this two summers ago, with lakes, bunkers and greens reconstructed. And if it all unravels somewhere on one of the back nines, remember that Bucy and the Boyz are in the house. Despite a patchwork quilt of swing flaws, corrections and equipment purchases, I know straining to reach the laces on my Etonics is Achilles A-1 for me. That I generate 100+ mph in clubhead speed out of a backswing shorter than the attention span of Little Johnny with ADHD the morning after Halloween has been described to me by one of the most acclaimed instructors in the game as a physiological impossibility; I like long odds at the track, too. Apparently, Bucy has a student not really that much older than me who picked up 10 mph through dedication to a prescription of exercise and flexibility. Ten extra might lead to a three-digit fine at the hands of the CHP, but in golf parlance that’s 30 yards. Hello. How can I get some of that cure? A former newspaper reporter, columnist, political hack and corporate flack, golf, travel and lifestyle writer Ken Van Vechten thought the life of a freelancer would free him of the horrid memories of time-clock employment and doing the bidding of others. He hadn’t contemplated editors. A Jell-O-solid 13+ on the course, he plays to a +6 at the table, in the kitchen and on the massage table.